Get the food whilst it's fresh! With a light up sizzling grill and the realistic ring-a-ding of a busy till the Chad Valley Tots Town Food Truck Playset is great for encouraging imaginative play. When the hatch is raised it's go time at the Food Truck; there's never a shortage of scrumptious food to provide a feast for the patiently waiting Tots of Tots Town. 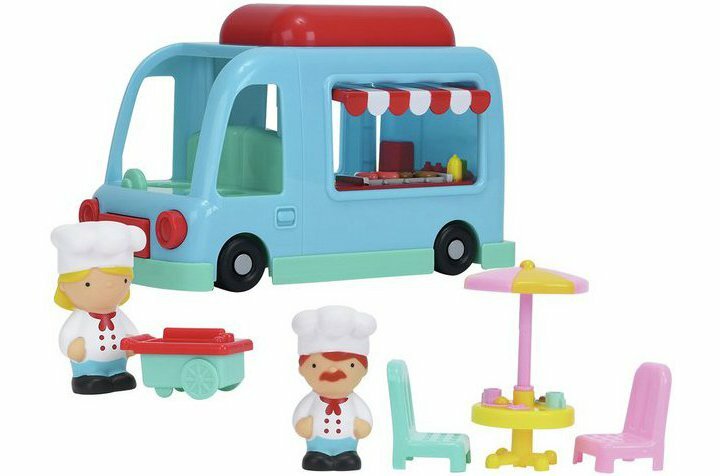 Playset contains 1 food truck playset with lights and sounds, two (2) each of chefs and chairs, and one each of a chef hat, table ice cream cart (Size H16, W24.5, D13cm). Get money off with April 2019 free Argos voucher codes, see if there's a discount code for the Chad Valley Tots Town Food Truck Playset product. 5.0/5 from 9 recent reviews.